This course focuses on a question: Can a machine be intelligent, and if so, is that dangerous? Major concepts from AI are presented at a level suitable for undergraduates in any field. After clarifying the possible meanings of this question and adopting standards for answering it, we examine the successes and failures of various methods used by computer scientists trying to create machine intelligence, including automating logical reasoning, neural modeling, swarm intelligence, and simulated evolution. Students conduct online experiments using existing AI software, such as performing a Turing Test, encoding the knowledge for an expert system, and using machine learning and neural network software tools to automatically acquire new knowledge from data. Soon after the appearance of the first electronic digital computers, a debate began about whether machine intelligence is possible, how it might be created, and what the implications would be should computers with a human level of intelligence appear. This debate continues today, but is now informed by a half-century of remarkable results in artificial intelligence (AI) and other aspects of computer science. For example, contemporary AI systems can converse in natural language, play chess at a Grand Master level, answer Jeopardy questions as well as the top contestants, diagnose some medical conditions more accurately than the best specialists, and drive vehicles in traffic on public highways. In some sense, machine intelligence has clearly arrived, but it is best characterized as simulating intelligent behavior rather than actually involving anything that could be reasonably viewed as an artificial mind. Chess playing programs, for example use a brute force approach that leverages the blinding speed of computers to examine many possible outcomes of any possible move so that the best one can be selected, while medical expert systems use collections of topic-specific rules that have proven to be extremely brittle in unforeseen situations. The increasing use of AI technology in the real world makes the nature and implications of AI relevant for everyone today, not just for the computer scientists and others who have historically carried on this long-standing AI debate. Yet most undergraduate students, including many of those in scientific and technical disciplines, do not have a basic understanding of how machines "think", or of how existing AI systems work under the surface in producing what superficially appears to be intelligent behavior. 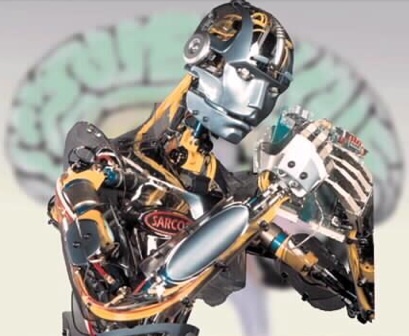 The intent of this course is to explain how real computer technology in AI differs dramatically from what is presented in the science fiction literature (Asimov, Saberhagen, Niven, others) and in film (movies such as Terminator, 2001, AI, and Star Wars), to illustrate how this technology can be applied in a student's field of study, to examine the prospects for achieving an artificial mind, and to assess the risk-benefit choices that society faces in co-existing with intelligent machines.